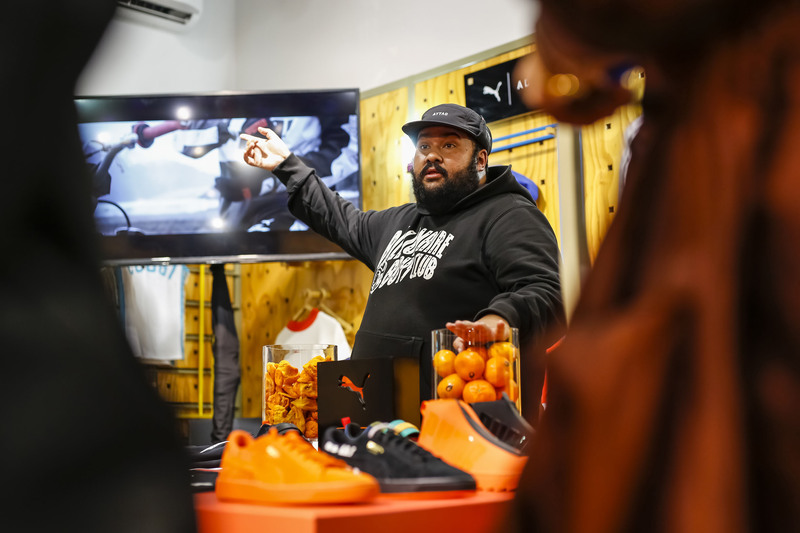 Last week Thursday the new PUMA and Atelier New Regime collab was launched at the Puma Select Store. This new drop is a motorsport-inspired collection with streetwear-ready styles popping in ANR signature safety orange hue. Atelier New Regime is a Montreal-based streetwear label known for their modern designs influenced by French – English ethnicities of the area. Known for their modern designs influenced by French – English ethnicities of Montreal, the motorsport-inspired collection is adapted into streetwear-ready styles. With thoughtfully designed technical detailing, it features ANR’s signature bright orange with a modern, polished aesthetic. Atelier New Regime began as a passion project and outlet for self-expression in 2009. Their love for art, design, photography, and street culture soon turned three dreamers into a collective of creatives. Challenging themselves to offer design-conscious pieces and innovative experiences, the brand is often recognised for its refined aesthetic, prominent slogans and striking use of the colour orange. For the AW ’18 debut collection, Atelier New Regime elevates seasonal staples by lending their design influence to a range of PUMA styles – from the classic Suede and Court Platform to the Basket Boot and TSUGI Jun. Characterised with rugged outsoles, reflective pullers and large rubberised logos, the collection tactfully blends the technical details of sports with street-ready styles. Ruling the pack is the Basket Boot ANR. Built with tonal neoprene upper, a waterproof branded zipper on the forefoot and rugged outsole, it drops in scarlet Ibis and PUMA Black colourways. The exclusive PUMA x ANR collection is available at PUMA SELECT, X-Trend, Superbalist and Madaiza.